Why should I choose a REAL Christmas tree? There is nothing like a natural Christmas tree to enjoy at Christmas time. The look, the scent and the very feel of a REAL tree are integral parts of the warm, homey atmosphere of our most festive season. 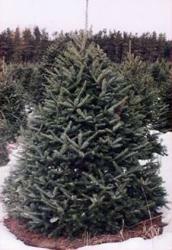 Choosing the perfect tree is a cherished tradition in many families. Whether you visit a retail lot or join the tens of thousands who treasure their annual visit to a choose-and-cut farm, you will enjoy knowing that your natural Christmas tree is great for the environment and provides employment for thousands of Canadians! Am I harming the forest by choosing a real tree? Definitely not! Christmas trees do not come from the forest! Almost everywhere in North America and for sure in Ontario, Christmas trees are grown as a crop on tree farms. For every tree harvested, there are ten more coming along, otherwise the farmer could not harvest each year. Is tree farming harmful to our environment? NO! Christmas trees are, except for cultivated forests, the most environmentally friendly crop around. This is because a tree is harvested only after ten years. To ensure future harvests, ninety percent of the farm must remain in trees all the time. How are real Christmas trees beneficial to our environment? CO2 is taken out of the atmosphere, counteracting the human use of fossil fuels. 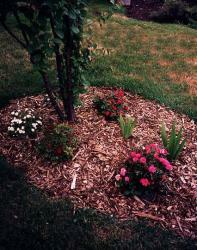 Trees also act as air pollution filters and can remove up to 13 tons of airborne pollutants per acre per year. Christmas tree farms are havens for a wide variety of bird and mammal species including grosbeaks, sparrows, chickadees, foxes, coyotes, mice, voles, and squirrels. The "edge effect" created by a stand of Christmas trees next to a woodlot or an open field is known to increase wildlife species diversity. Will my Christmas tree cause problems at the landfill site after Christmas? No. Most municipalities collect discarded natural Christmas trees and chip them for use as mulching materials. Real Christmas trees are completely biodegradable and will, on their own, break down and return their stored nutrients to the soil from which they came. There are also other ways in which REAL Christmas trees go right on giving long after the Christmas season is over. They can be used as bird feeders, wood products can be made from their stems or they can be used as wildlife cover in fish ponds and woodlots alike. Where does the tradition of evergreens at Christmas originate? Legends tell of the decorated tree used in winter celebrations long before the advent of Christianity. Plants and trees that remained green all year had a special meaning for people during winter. Just as people today decorate their homes at Christmas with pine, spruce and fir trees, ancient people hung evergreen boughs over their doors and windows. In many countries people believed that evergreens would keep away witches, ghosts, evil spirits and illness. Egyptians brought green palm branches into their homes in late December as a symbol of growing things. Romans trimmed evergreen trees with trinkets and topped them with an image of their sun god to celebrate Saturnalia. Druid sorcerers hung golden apples and lit candles on oak trees to celebrate the winter solstice. In the middle ages, the feast of Adam and Eve was held on December 24. Its symbol was the Paradise Tree, a fir tree hung with red apples. It is generally agreed, however, that the use of an evergreen tree as part of the Christian Christmas celebration started 400 years ago in Germany and spread to most of northern Europe by the l9th century. Canada was first introduced to the Christmas tree in 1781 in Sorel, Quebec, by a German immigrant, Baron Friederick von Riedesel. 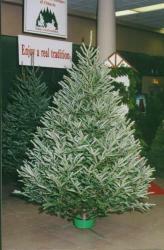 The Baron's tree was a balsam fir cut from the dense forest of Quebec and was decorated with myriads of white candles. The Christmas tradition that is celebrated in Canada today has borrowed many customs from many lands, but families who have come from all over the world have all adopted the Christmas tree as the symbol and centerpiece of the festive season. As it has for centuries, the evergreen still symbolizes our belief in renewed life and the hope and faith that lives in all mankind, regardless of race or creed.